Front of the recipe card for Fried Stuffed Eggplant. 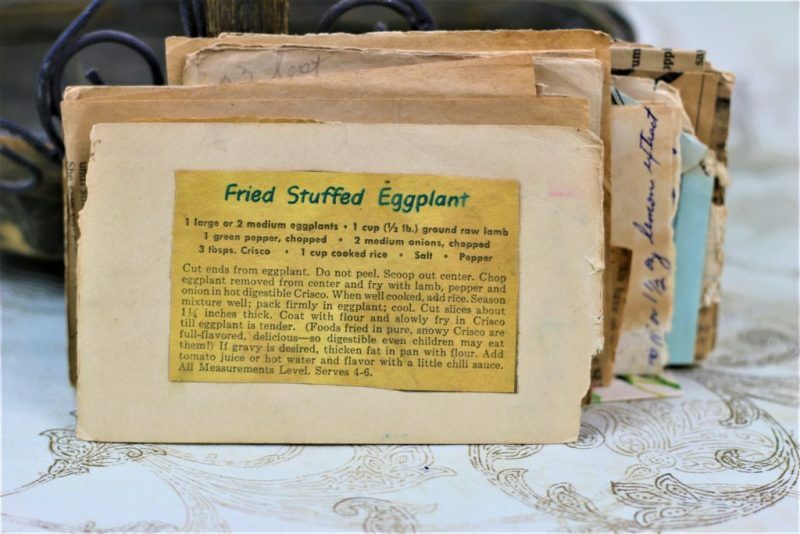 There are lots of fun recipes to read in the box this recipe for Fried Stuffed Eggplant was with. Click here to read the history of Vintage Recipe Box 100 and click here to view all of Vintage Recipe Box 100 recipes. We have lots of recipes on the site that may be of interest to you. Use the links below to view other recipes similar to this Fried Stuffed Eggplant recipe. Start your own recipe box or your family or friends. Click here to view New and Vintage Recipe Boxes. Once you have your recipe boxes, you will need recipe cards. Click here to view Recipe Cards and Templates. Want to protect your recipe cards from splats and splatters in the kitchen? Click here to view Recipe Card Protectors and Sleeves. I love vintage dishes and kitchenware. On the weekends I can often be found in a thrift store poking through the shelves to find vintage treasures to use as props for our photography for the site. Click here to view Vintage Kitchenware on Etsy. Every once and a while you can find a good cookbook with Vintage Recipes on Amazon. I don’t have any recommendations as I haven’t bought any as I prefer the handwritten recipes that you see on our site. We would love to interact with you about our vintage recipes. Join us on your favorite social media platform by clicking the links below. If you make this Fried Stuffed Eggplant recipe, please share your photos and comments below! Chop eggplant removed from center and fry with lamb, pepper and onion in hot digestible Crisco. When well cooked, add rice. Season mixture well; pack firmly in eggplant; cool. Cut slices about 1¼ inches thick. If gravy is desired, thicken fat in pan with flour. Add tomato juice or hot water and flavor with a little chili sauce. 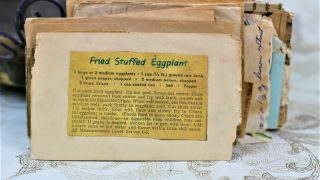 A lover of family traditions, I decided to create this project to "save" recipes from our past from being lost forever.